The purpose of land information search is to determine the true ownership of the land you are about to buy. Sadly, the majority of people fail to do this. Consequently, they may fall into wrong hands and buy land from a fraudster, thereby losing their hard-earned money. Some others don't fall into wrong hands. They buy from someone who appears to own the land. Unfortunately, they discover years later . . . after they have built an expensive house on the land . . . that the state government took over ownership of the land decades back. Why would anyone in his right senses fall into such mess? It happens for one of three reasons. in the neighbourhood told him that the entire stretch of land on the right side of the road was owned by the Lagos state government. He considered himself fortunate because the land he wanted to buy was on the left hand side of the main road leading to the area. His would-be neighbours assured him that the land was free from government acquisition. He asked his lawyer for his opinion and whether it is necessary to cross-check that information with the state government. His lawyer said the people living in the neighbourhood usually have first hand land information especially about their community. However, he promised he was going to double-check that information with the land bureau. The following week my friend paid for the land. Since his tenancy in the house where he lived was about expiring and the landlord was a pain in the neck, he decided to speed up the construction work. In just 4 months, the house was completed . 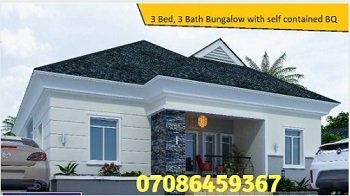 . . a beautiful 3 bedroom bungalow with kitchen, dinning, store, 3 toilets, and more. Two years later, he discovered the land wasn't free of government acquisition as he was told. Actually, the land was free of acquisition initially. But the ownership was revoked some five years earlier supposedly because of repeated dispute between two feuding communities over ownership of the land. As the story went, the bloodshed was so much and recurring that the state government took the land over. That is the side of the story my friend heard some 2yrs after he had sunk his hard-earned money into the land . . . about 6 million Naira invested in building his lovely bungalow apartment. If only he had done a land information search earlier! "It's better late than never", he told himself. So, he invited an estate surveyor to do a land information search for him with the Lagos state lands bureau. Fortunately, the land he bought had a survey done on it earlier. However, a quick search revealed that the survey was not registered with the surveyor general's office and so was not valid. Even the coordinates on the survey plan could not be trusted. My friend was appalled. What kind of country is this! then be done if the land is free of acquisition. And so the test survey was done. The result? The land ownership was revoked by the state government about 5 yrs back. The revocation order by the then state governor was even attached to the master survey plan at the surveyor general's office. This means that the land was already taken over by the state government as at the time my friend bought the land. If only he had done appropriate land information search before buying! But now it was too late. The land information search he did at the late hour simply revealed the obvious. Now he was stuck. He was told ratification was not possible. information search with the land bureau. The house you are about to buy may be on government acquired land or land proposed for railway track, low cost housing scheme, or some other state government project. You never know. Click HERE to view list of land for sale in Lagos within gated estates that have genuine title documents. Buying land for sale within formal gated estates will ensure you buy genuine properties and have peace of mind to enjoy your investment.